slide all enclosed inside of one unit. This moonwalk is very interactive for all ages. enjoy climbing up the steep steps to this wonderful slide. will match your plates and cups perfectly! 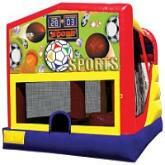 bouncing section, a climbing wall and slide.